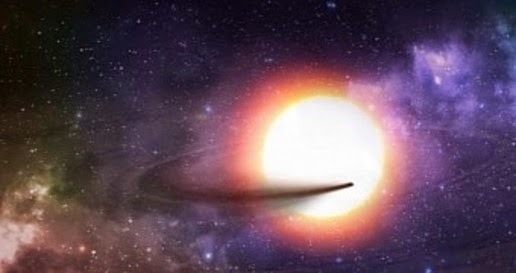 Astronomy Science ~ Located about 1,500 light-years from Earth, a rocky planet called KIC 1255b slowly destroyed by the intense heat of its parent star. Thus, astronomers say that this celestial object so hot that rocks on the surface are evaporated. It appears that all debris and dust planet spilled into space and form a tail like a comet. The tail is quite beautiful as it moves in its orbit, circling its parent star. In a paper published in the Astrophysical Journal, scientists say that after studying the planet Herschel telescope in the Canary Islands, they discovered that the planet's surface is heated to a temperature of 1,800 degrees Celsius (about 3,300 degrees Fahrenheit). Illustration of the planet and its parent star KIC 1255b. This planet is very hot so that rock on the surface evaporates into space forming a tail-like comet. The reason is very hot rocky planet as it orbits very close to its parent star. In fact, its orbit is very small so that the researchers can estimate a year on this planet lasts less than a day on Earth. "A year in KIC 1255b lasted only 16 hours on Earth and appear throughout the body of this planet boil", said astronomer and lead author of the study Jakub Bochinski of the Open University in the UK said in a statement. In terms of size, not too big 1255b KIC. The planet is similar to our cosmic neighbors Mercury, whose fingers were about 2,500 kilometers (1,500 miles). In fact, it is so small that it is very difficult to see. However, astronomers say that, when flying around its parent star, the planet is about 1% light blocking its parent star, the same as if the giant gas planets are in place. This is because the tail of dust and debris that followed the planet. Jakub Bochinski and colleagues explain that, in the coming months, they hope to use the Herschel telescope to peer anatomy of this planet. More precisely, astronomers say that they plan to look more closely at the tail which consists of dust and debris that looks like a comet's tail. Whatever their data should help them gain a better understanding about what KIC 1255b made of this. "By doing that we can know how the nature of our solar system, helping us learn more about how Earth and other planets are formed," said astronomer Jakub Bochinski.